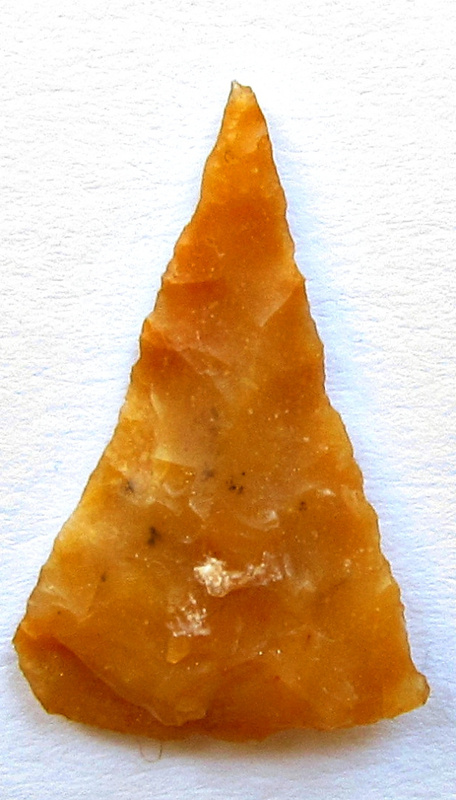 This is a translucent yellow Neolithic, 3,1 cm long bifacial point, found more than 40 years ago in the Erg Chech / Algeria. The Algerian sand seas (Ergs) today are an almost uninhabited part of the greater Sahara Desert, an inhospitable desert region with long, extremely hot summers and short, very warm winters. The Erg Chech is a vast sandy expanse including compound and complex linear and star dunes. The mean elevation of the Erg Chech is just above 300 m, slightly lower than the neighboring Erg Iguidi stretching to the north. The barren plain of the Tanezrouft is located to the southeast. The sand seas border Algeria, Mali, and Niger. Much progress has been made in the evaluation of early and middle Holocene cultural and subsistence changes in the Maghreb, pointing to a specific North African pathway to a more sedentary lifestyle, including an active role of Epipaleolithic groups to a mixed economy based on pastoralism, the consumption of wild animals and plants, with no evidence for agriculture using domesticates, a lifestyle fully developed at 7,5 k.a. cal BP (Mulazzani et al. 2017). On the other hand, excavations in the deep Sahara stoped during the late 1970ies. Geological research showed, that the Algerian Sahara enjoyed a warm, humid climate at 8,5 k.a.. The fertile Sahel region stretched much further north. As the eastern part slowly dried out some 5,3 k.a. Therefore incoming populations had a window of opportunity of settling the Holocene "Green Sahara". Artifacts, pot sherds and other remains are common on the Saharan surface, but the "when", "why" and "how" of the settlement systems remains unknown, after older cultural historical approaches have been discredited.